Michael Labeit at EconomicPolicyJournal.com: Defending "Draft Dodging"
A review of "True Grit" by Fox's Bill O'Reilly was published on Dec 31 in the New York Post (the review is available here). The remake easily receives O'Reilly's blessing but Jeff Bridges' performance, O'Reilly holds, still pales in comparison to that of John Wayne's. "I liked both versions of 'True Grit,'" O'Reilly claims. "But for me, it was Wayne who still deserves most of the cheers. The man was larger than life, a symbol of the insurmountable American spirit." "In 1969," O'Reilly writes, "when the original version of "True Grit" was playing in the movie theaters, Americans were looking for heroes such as Wayne to show them nobility. Today there are far fewer heroes, and we don't expect much nobility, even in the movies [italics mine]." "For those of us who served in the military during World War II, it is a travesty for Bill O'Reilly to call draft dodger John Wayne a hero ("When Americans Valued True Grit," PostOpinion, Dec. 31). While many male Hollywood stars served valiantly during the war, Wayne was safe at home, doing movies for Republic Studios." It is one thing to object to Wayne's canonization if you take into account his support for HUAC and his views on the Vietnam war. But criticism of Wayne qua "draft dodger" is contingent upon flimsy premises. Though there are numerous subdivisions and distinctions involved, draft dodging essentially is the circumvention of compulsory military service mandated by one's own government. Like tax circumvention, there are two types of draft dodging: draft avoidance and draft evasion: The first refers to legal methods of eschewing compulsory military service while the latter refers to illegal methods. According to Wikipedia, it seems Wayne was guilty only of a passive kind of draft avoidance; he was exempted initially via a 3-A deferment and then via a 2-A deferment thanks to his film studio that hustled to set legal obstructions to his enlistment (this is WW2 of course). It matters not to me that Wayne failed to actively resist conscription; my moral estimate of him would not change even if he lit his cigar with his draft card and fled to Toronto. 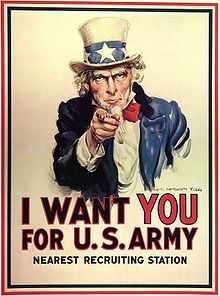 I reject as obnoxious the notion that older men today who failed to serve in WW2, Korea, or Vietnam must explain themselves or atone for their absence abroad. Republicans and conservatives are up in arms today (and rightly so) because of the "individual mandate" contained within Obamacare that, with a few exceptions, unconditionally coerces people to do something, in this case to participate in the health insurance market. They ipso facto condemn Obamacare. The same can be predicated of conscription; it too, with a few exceptions, unconditionally coerces people to do something, in this case to participate with the military. Thus, ipso facto, it is wrong as well and should receive the same condemnation from the same people. Naturally, there are economic objections to conscription as well. It reduces the labour supply and thereby increases wages, i.e., production costs. It redirects the allocation of productive factors towards the military which, while a necessary enterprise it may, is also an unproductive one. But furthermore, it disrupts the natural tendency of market participants to assume those roles for which they possess a comparative advantage. A conditional truism of economics is that production is maximized when producers adopt those economic roles in which they have a comparative advantage. The market encourages adherence to the principle of comparative advantage by maximizing the revenue of those who comply with it. By meddling with the market, conscription meddles with compliance to comparative advantage. John Wayne obviously had a comparative advantage as an actor (see #13). What evidence is there that he would have better served his countrymen as a soldier? Furthermore, why should we demand yielding to conscription to begin with? One would think that the 13th Amendment prohibiting involuntary servitude would similarly outlaw compulsory military service. The contradiction of enslaving some to free others is also something the ignorance of which has become impossible for me to succumb to. A person who actively protests involuntary servitude by resisting it is, again ipso facto, a hero (depending of course on their intentions) and we most certainly should think twice before we reprimand innocent individuals for refusing to have their property or their lives disposed of by, as they say, "some govmint bureaucrat" in Washington who knows not the implications of his indifference. So I take it from your economic and moral premises shared in this post that you also reject government wholesale for the same reasons and have now adopted the only consistent position, that of a private property society (also known in some circles as anarchy)? The question is a loaded one. And I scarcely would abandon my pro-government position with such ease. It takes a man of true strength to fight himself and still manage to come out on top. While many respect John Wayne's skills as an actor, myself included, the person side is dimmer. He sought deferment legally in 1940 being the father of five children and then spent the war years building himself up as a leading male actor-while others were fighting the war. His post-war years were spent proving himself worthy as a patriot as many do following a conflict not participating in (George W. Bush Jr., O'Reilly, Rove, etc.). Wayne's anti-communist actions hurt many innocent people while he joined efforts with fellow military avoider J. Edgar Hoover, fellow actor Ward Bond and Joe McCarthy. Should we hold Wayne's draft deferment against him....no and yes....as a Vietnam Vet, I sincerely feel he should have fought the case himself and not let studio attorneys plead his case. Same with many renown draft avoiders during the Vietnam Era who used influence instead of morality guide their course, i.e. Rush Limbaugh, Dan Quayle, etc. John Wayne's action after the war are not pretty since his basis is questionable. To "John Wayne" it in Nam was not flattering at all and this describes his political activities. John Wayne was a cinematic war hero, one who gained great wealth. He did face the danger of an open bottle of booze, on a regular basis. There is no evidence that he was in any way patriotic in a quest to defend his county.